Häuschen sind sehr schön. Veranda ist toll. Leider recht hellhörig. Einige Gäste sehr laut draussen grölend. Insgesamt toller Aufenthalt. Where to find Costa de la Luz Huelva hotels near an airport? How can I find hotels in different Costa de la Luz Huelva neighborhoods? Where can I find hotels in Costa de la Luz Huelva that are near tourist attractions? Spending several nights in Huelva and want to stay in or near Costa de la Luz Huelva? There are 4 Expedia-listed accommodation options within easy driving distance of the heart of town. 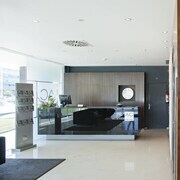 Within easy driving distance of Costa de la Luz Huelva, are the Hotel Martín Alonso Pinzón and AC Hotel Huelva by Marriott. If you have to be mindful of your budget and are simply after the most affordable Costa de la Luz Huelva accommodation options, there are enough economy hotels to choose from in the area. 35 kilometres (22 miles) from Costa de la Luz Huelva's center you'll find the Leo Islamar. The Apartamentos Leo Punta Umbría is only 14 kilometres (8 miles) away. The Leo Apartamentos San Bruno and the Leo Punta Umbría Deluxe - Apartment are two other economical places that you could look into. The Playacartaya Spa Hotel can be found 20 kilometres (13 miles) away from the center of Costa de la Luz Huelva. Another hotel is the Garden Playanatural - Adults Only, which is situated 25 kilometres (14 miles) away. 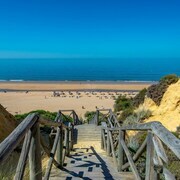 Two other Expedia-listed alternatives around Costa de la Luz Huelva include the Parador De Mazagon Huelva and the Barcelo Punta Umbria Beach Resort. Looking for more to do? Spend the day visiting Isla Cristina Beach and Islantilla Shopping Centre, which you'll find in Isla Cristina, 40 kilometres (25 miles) to the west of Costa de la Luz Huelva. The Barceló Isla Cristina and Vime Islantilla are just some of the Expedia-listed hotel and apartment alternatives in Isla Cristina. 25 kilometres (15 miles) to the west of Costa de la Luz Huelva, you can also stay at El Rompido, home to the Precise Golf Resort El Rompido The Hotel and Hotel Fuerte El Rompido. While in El Rompido, don't miss the EL Faro Shopping Center and El Rompido Golf Course. Get your sports fix by making a trip to Plaza de Toros de la Real Maestranza, which is 75 kilometres (48 miles) to the east of Costa de la Luz Huelva. For travelers who are keen on booking a bed close by, make a reservation in the Hotel Alfonso XIII, a Luxury Collection Hotel, Seville or Corral del Rey. If you are flying into or out of San Pablo Airport and are looking to stay nearby try Apartamentos Luxsevilla Palacio or Hotel Vértice Sevilla. What are the most popular Costa de la Luz Huelva hotels? Are there hotels in other cities near Costa de la Luz Huelva? 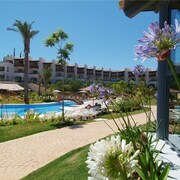 What other types of accommodations are available in Costa de la Luz Huelva? Explore Costa de la Luz Huelva with Expedia.ca’s Travel Guides to find the best flights, cars, holiday packages and more!